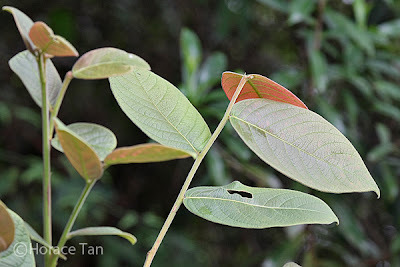 Caterpillar Host Plants: Glochidion brunneum (Euphorbiaceae), G. superbum (Euphorbiaceae) and one un-identified plant in the nature reserve. The upper- and underside of a female -f neftina Colour Sergeant. 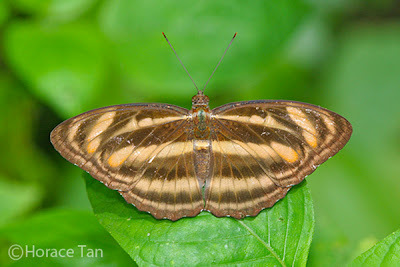 The upper- and underside of a female -f subrata Colour Sergeant. 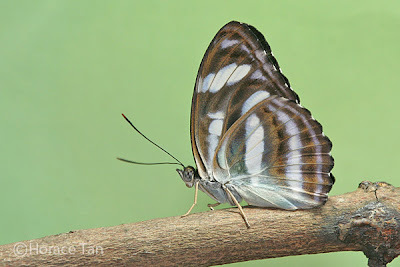 The upper- and underside of a male Colour Sergeant. 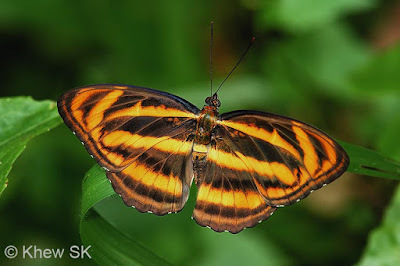 The adult has a closed cell in the forewing. The upperside of the forewing has contiguous/conjoined white cell post-discal spots from the dorsum to spaces 2 and 3. and confluent post-discal spots in spaces 4, 5 and 6 with their inner edge in line. The sexes are dissimilar. The male is a rich velvety black, with white markings tinged with bluish. 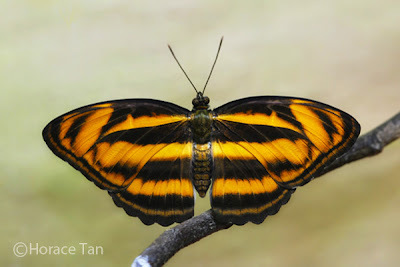 The male in Singapore typically has an orange sub-apical spot in space 6 on the forewing upperside. 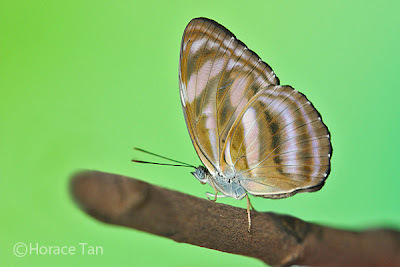 This spot is usually white for males found in the Malay Peninsula. The female occurs in two distinct forms. In the -form neftina (Fruhstorfer) the wings are marked with broad orange-brown stripes arranged in the usual manner. The -form subrata (Moore) is a dark dull chocolate brown, with narrow and rather diffuse tawny brown markings. Both female forms are less abundant than the male, with -f neftina appears to be more common among the two female forms. A female -f neftina Colour Sergeant. 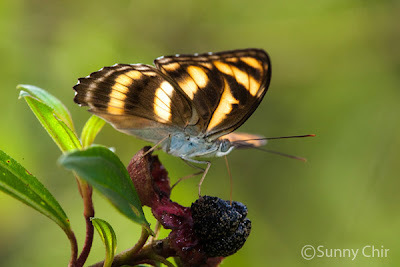 A female -f subrata Colour Sergeant perching on a leaf in a western wasteland. 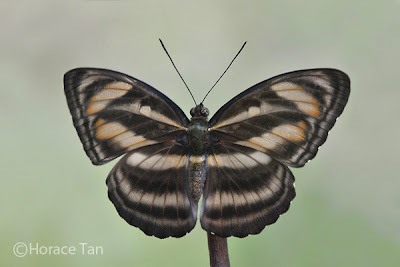 Field Observations of Butterfly Behaviour: This species is relatively common in Singapore. Sightings of the fast flying adults are rather frequent and widely distributed, both in nature reserves and urban parks. In sunny weather, both sexes can be found flying in the vicinity of flowering shrubs and taking nectar. 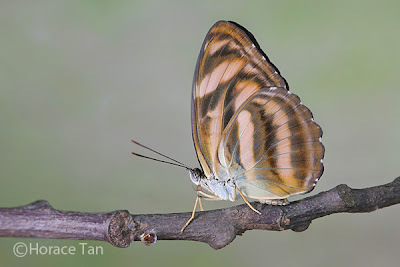 A female -f neftina Colour Sergeant visiting a ripened fruit of the Singapore Rhododendron. 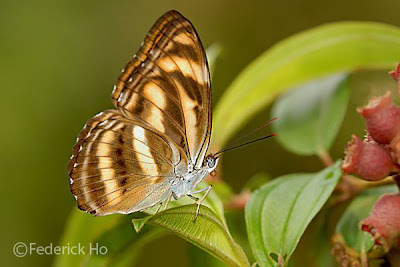 Another female -f neftina Colour Sergeant perching on a leaf of the Singapore Rhododendron. 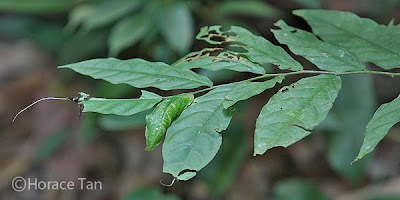 Host plan: an unidentified plant in the nature reserve with leaves playing host to a number of Colour Sergeant caterpillars. Thus far, two species of Glochidion and one un-identified plant (likely to be a Glochidion sp. 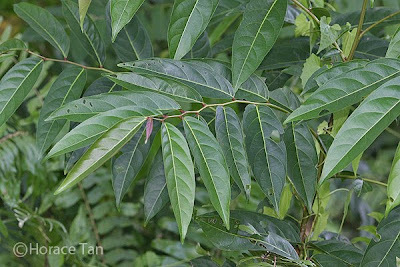 too) have been identified as the local host plants. 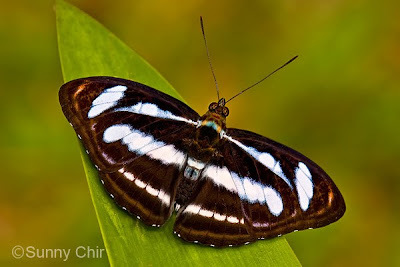 Caterpillars of the Colour Sergeant adopt the same feeding and frass-management routines as described for the Commander and other Athyma species in earlier blog articles. Two views of an egg of the Colour Sergeant. 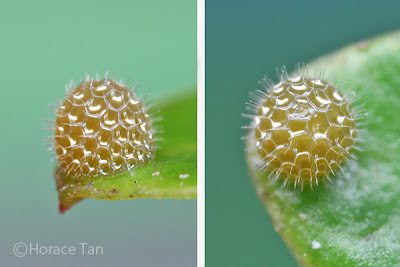 The eggs of the Colour Sergeant are laid singly at the tip of a leaf on the host plant. The dark yellowish eggs are somewhat globular in shape, with its surface marked with hexagonal pits and bearing short spines at pit corners, giving them the appearance of minute sea-urchins. Each egg has a diameter of about 1mm. 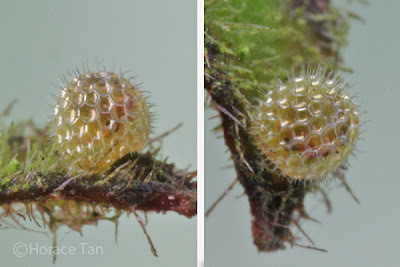 Two views of a mature egg of the Colour Sergeant. The head and mandibles are visible in the right view. The egg takes about 2-3 days to hatch. The young caterpillar emerges by eating away part of the egg shell. The rest of the egg shell becomes the first meal for the newly hatched, which has a cylindrical pale yellowish green body covered with many small tubercles and short setae. The head capsule is pale to dark brown in color. A newly hatched caterpillar of the Colour Sergeant, length: 1.8mm. 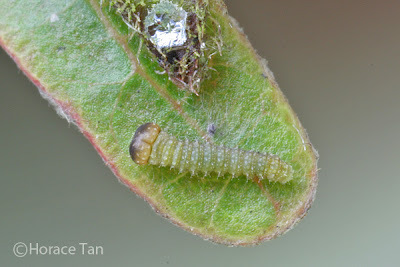 Similar to the feeding habit of the other Athyma spp., the 1st instar caterpillar of the Colour Sergeant also feeds from the leaf tip and leaves the midrib intact and protruding. A frass chain is also constructed laboriously by the young caterpillar at the tip of the exposed midrib. Between feeds, the caterpillar rests on either the exposed midrib or the frass chain. In later instars, the caterpillar tends to rest near where the protruding midrib joins the remaining lamina. At this site, it also attempts to camouflage itself with a collection of frass pellets secured with silk threads to the lamina. 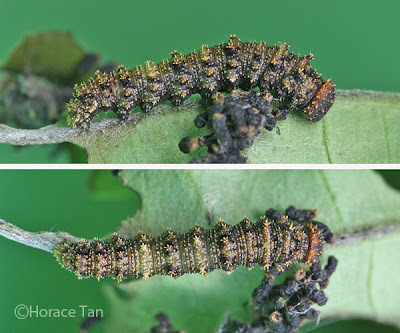 Two views of a 1st instar caterpillar of the Colour Sergeant. Length: 5mm. 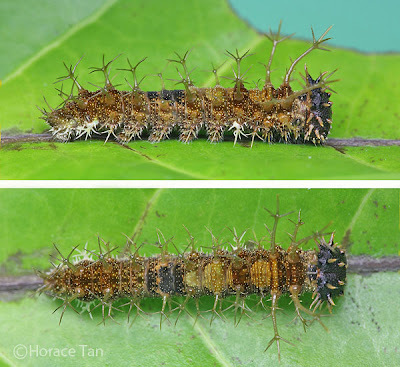 After reaching about 4.5-5.0mm in about 3 days, the caterpillar moults to the 2nd instar. 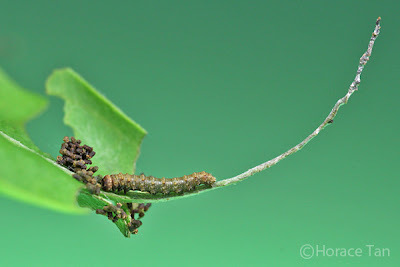 The body color of the 2nd instar caterpillar is dark brown with a green undertone. There are a number of small and dark dorsal and lateral patches. 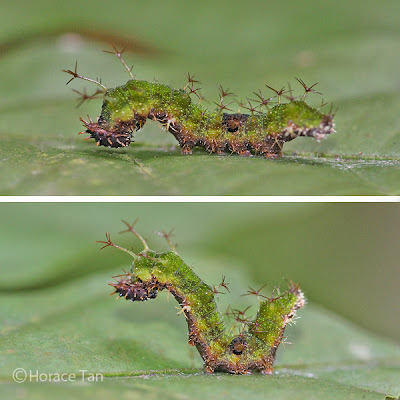 Besides tiny tubercles covering most of its body surface, the 2nd instar caterpillar also features short and branched spines dorso-laterally and spiracularly. The head capsule is dark brown and dotted with a number of conical tubercles. This instar lasts about 2-3 days with the body length reaching 6.5-7.0mm. 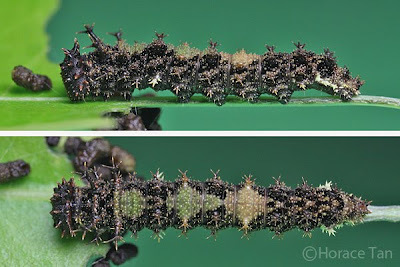 The 3rd instar caterpillar has slightly longer dorsolateral spines, with pairs on thoracic segments longer than the rest. Its head capsule is dark brown to black irorated with pale brown tubercles. Broad pale brown markings on abdominal segments 3 and 5 with a diamond-shape outline become increasing prominent during this stage. 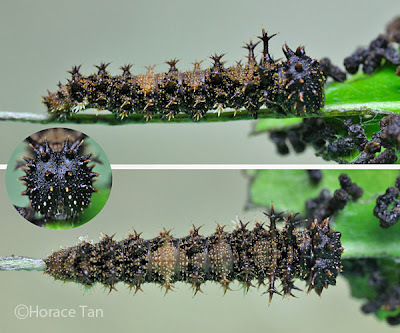 This instar takes about 3 days to complete with body length reaching about 10-11mm. 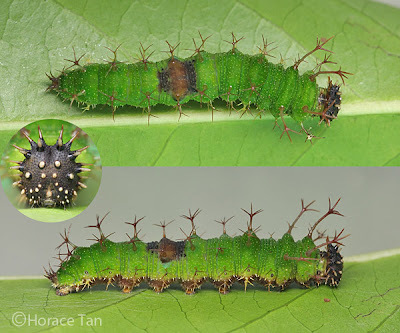 Two views of 3rd instar caterpillar, late in this stage. .Length: 11mm. The 4th instar caterpillar has much longer dorso-lateral spines which are heavily branched. The body is brown to black in color. Besides conical tubercles, the head capsule also carries some short spines. Broad pale green markings appear on the dorsum of the 1st and 3rd abdominal segments. Also, pale brown to pinkish brown marking appears on the 5th abdominal segment. This instar lasts 3-4 days with body length reaching about 18mm-19mm. 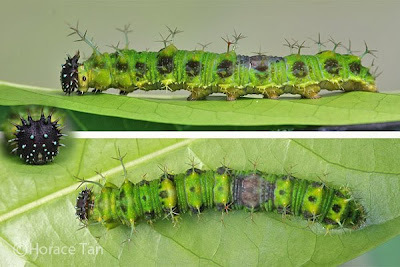 Two views of 4th instar caterpillar, late in this stage. Lengths: 14.5mm. In the 5th (final) instar, the branched dorso-lateral spines very well developed on all body segments with those on the meso- and metathorax being the longest. Newly moulted caterpillar has yellowish brown body colour with broad dorsal markings on the 1st and 3rd abdominal segments and a broad black dorsal marking on the 5th abdominal segment. The body base color soon changes to a uniform green color as growth proceeds in this instar, leaving only the saddle marking on the 5th abdominal segment in contrasting reddish/pinkish brown. The dark brown head capsule has much longer and pointed spines. 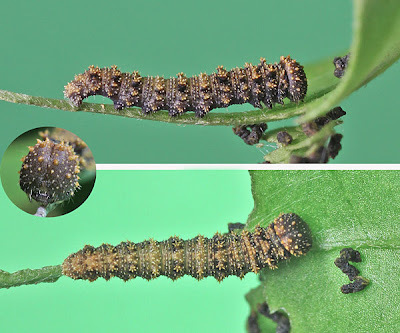 Two views of 5th instar caterpillar, early in this stage. Lengths: 20.5mm. 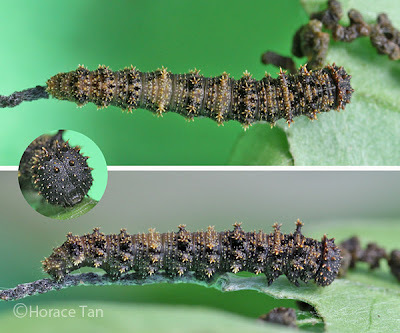 Two views of a 5th instar caterpillar, later in this stage, length: 30mm. 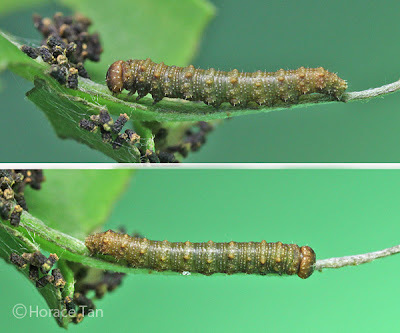 Two views of a 5th instar caterpillar adopting an on-guard stance. 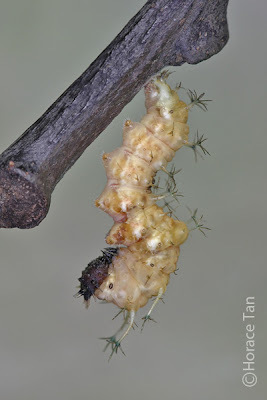 The 5th instar lasts for 4-5 days, and the body length reaches up to 35mm. On the last day, the base body colour changes to yellowish green and then to yellow. Rather large dark markings, roughly circle in shape, also appear laterally. 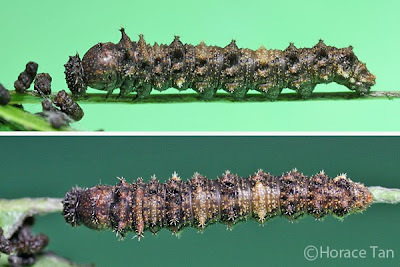 Two views of a 5th instar caterpillar, late in this stage, length: 35mm. Additional dark patches have appeared dorsally and laterally. 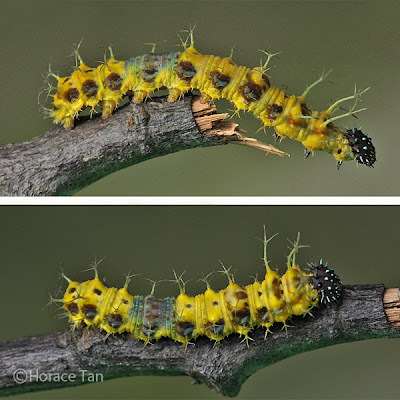 Two views of a 5th instar caterpillar, late in this stage, with base color changed to yellow. Soon, the caterpillar ceases feeding and wanders around. Eventually it chooses a spot on the underside of branch/stem/leaf and spins a silk pad from which it hangs vertically to take on the pre-pupatory pose. Pre-pupatory larva of the Colour Sergeant. Pupation takes place a day later. The pupa suspends itself from the silk pad with no supporting silk girdle. It is almost entirely pale brown in color with segments and parts outlined in a darker shade of brown. A few gold patches also adorn the pupal surface. The abdominal segments are slender, and the thoracic portion being larger and expanded laterally. Dorsally, there are two prominent processes curved towards each other. When disturbed, the abdominal segments flex laterally, and could stay in that position for a period of time. Length of pupae: 23-25mm. The pupation event of a Colour Sergeant caterpillar. 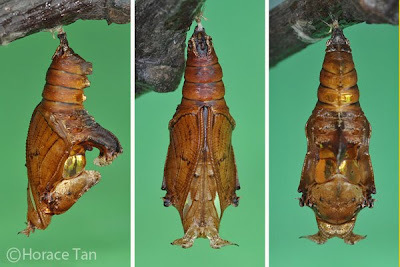 Three views of a pupa of the Colour Sergeant. 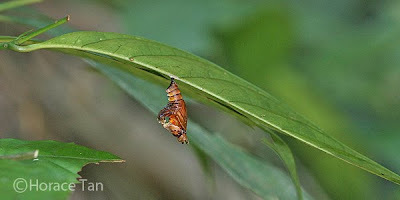 A pupa of the Colour Sergeant sighted on the underside of a leaf in the nature reserve. After about 5-6 days of development, the pupal skin turns translucent as the development within the pupal case comes to an end. 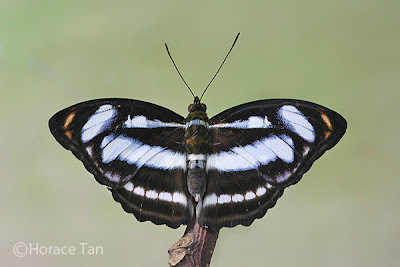 The spots and streak on the forewing upperside also become discernible. 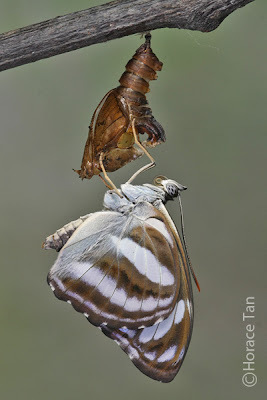 The next day, the adult butterfly emerges from the pupal case, typically during the morning hours. 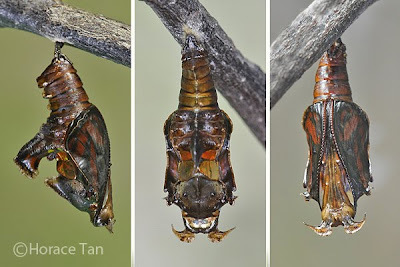 Three views of a mature pupa of the Colour Sergeant. The eclosion event of a male Colour Sergeant at 2x speed. A newly eclosed Colour Sergeant resting on its pupal case. Text by Horace Tan, Photos by Sunny Chir, Federick Ho, Khew SK and Horace Tan.